This page on JUGFET vs MOSFET describes difference between JUGFET and MOSFET. In an field Effect Transistor (FET) which is unipolar device, narrow channel of doped semiconductor connects source and drain contacts. The voltage subjected to the third terminal referred as Gate determines current flow from source(S) to the drain(D). 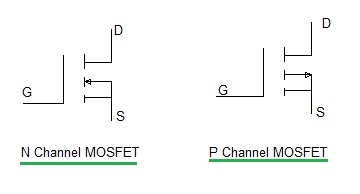 There are two main types of FET, the JUGFET and MOSFET as described below. JUGFET stands for Junction Gate FET. An n-channel JUGFET is depicted in the figure. Action of this device depends on formation and control of depletion layer at p-n junction which is reverse biased. p-type gate is more heavily doped compare to n-type channel. Hence depletion layer lies within channel itself. In JUGFET, with respect to the source terminal, drain voltage (VDS) is positive and Gate Voltage (VGS) is negative. If VGS is increased negatively then depletion layer becomes more widen. This results into narrower channel and reduction in the current flow. The performance of JUGFET is defined by transconductance , gm . It is the ratio of change in ID caused by change in VGS. MOSFET stands for Metal Oxide Semiconductor FET. In JUGFET, if gate voltage will made positive, then this will forward bias the gate channel p-n junction. This results into fall in input resistance and flow of large amount of current. MOSFET overcomes this demerit of JUGFET and both positive and negative voltages can be applied to the gate terminal for its operation. 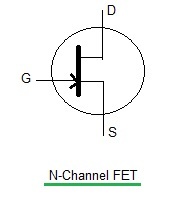 Figure depicts basic symbol of an n-channel MOSFET. When VGS is negative, positive holes are attracted into the channel region from the substrate part. This results into reduction in amount of electrons in the channel part and hence ID will be decrease. This is referred as depletion mode of operation in MOSFET. In MOSFET, if VGS is made positive, electrons are attracted into the n-channel region. This results into increase on conductivity and hence ID will increase. This is referred as enhancement mode of operation in MOSFET. Following parameters mention difference between these two transistor(JUGFET and MOSFET) along with basic CE junction transistor. MOSFET is used in IC construction due to its compact size. MOSFET gate is protected from static charge which will easily build up and hence breaks the insulation of the oxide layer. To avoid this situation, MOSFET is usually supplied with metal clip short circuiting leads. This clip will only be removed just before device need to be connected or soldered on the electronic circuit.